The exciting new documentary whose upcoming release we announced in a September 8 article is now here. 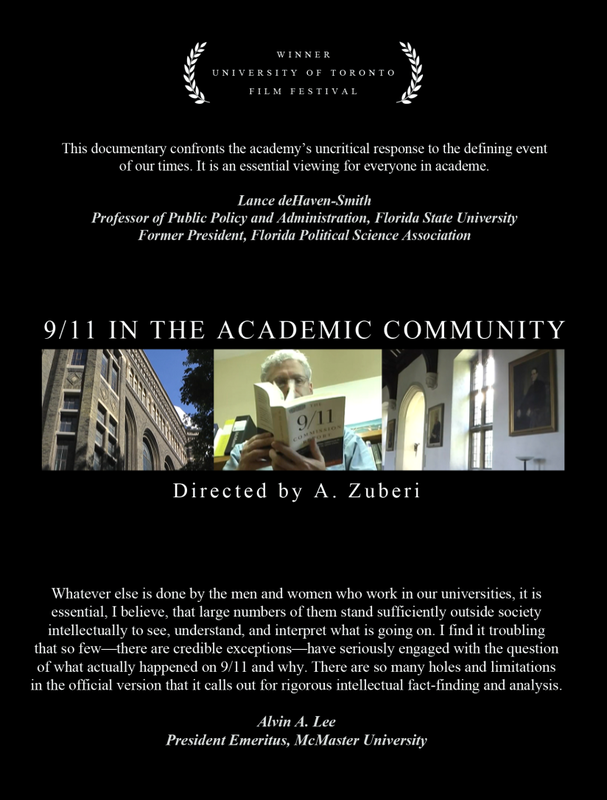 9/11 in the Academic Community was released for purchase on October 8, after having won an award for “Documentary Achievement” at the University of Toronto Film Festival earlier this year. At a manageable running time of 75 minutes, with a title designed to appeal to its target audience, and by avoiding hot-button phrases such as “9/11 Truth,” the film has an excellent chance of slipping out of the conspiracy theorist jacket and making inroads into the American and Canadian intellectual communities. It is a unique film that documents academia's treatment of critical perspectives on 9/11 by exploring the taboo that shields the American government's narrative from scholarly examination. Through a powerful reflection on intellectual courage and the purpose of academia, the film aims at changing intellectual discourse on 9/11 and the War on Terror. Please inform your friends about this documentary's release. The new feature length documentary from Dean Puckett (The Elephant in the Room) featuring international security analyst Dr. Nafeez Ahmed (The War on Truth: Disinformation and the Anatomy of Terrorism , The London Bombings: An Independent Inquiry ) is out to watch online, download and buy. The best introduction to the movement, following the 9/11 familes' search for truth, and their fight to get an investigation into 9/11, which they ultimately found unsatisfactory. It is the most conservative 9/11 film, and it is has also been the most ignored by the mainstream media. After watching it, you'll see why. This film alone, dispelling every crackpot insult you've ever heard lobbed at the movement, puts those comments to shame. Best summary of the official report. In a presentation by Professor David Ray Griffin, he asks "What's wrong with the official report?" This presentation builds on the evidence presented in 9/11: Press for Truth and goes on to detail even more disturbing contradictions and false-hoods. This is the expert-packed feature-length,Pre-Release v1.3, Low-Res documentary by Architects & Engineers for 9/11 Truth. Help us to make the most of the opportunity provided by the 10th anniversary of 9/11 to publicize the evidence about the destruction of the 3 WTC high-rises on 9/11. Visit the dedicated website http://911ExpertsSpeakOut.org to watch or download the high-res video. Support AE911Truth by sharing the website http://911ExpertsSpeakOut.org with your family, friends, and associates - and have them watch it on high resolution Pay Per View and/or download the film also. http://www.ae911truth.org/en/home/68-contribute-to-ae911truth/420-donate-ae91... with your $5 or $10 donation so we can complete the film's Final Release before November. This is the trailer for the expert-packed feature-length documentary by Architects & Engineers for 9/11 Truth. The documentary premieres around the world the week prior to September 11, 2011. Help us take advantage of the lead-up to the 10th anniversary to publicize the evidence about the destruction of the 3 WTC high-rises on 9/11. See the AE911Truth Action Alert, http://ae911truth.org/news-section/41-articles/544-eso-trailer.html, and share the trailer "Experts Speak Out" http://www.911ExpertsSpeakOut.org with family, friends, and associates. Don't forget your Facebook, Twitter, and other contacts. Order the DVD today at http://www.ae911truth.net/store while stock lasts in order to guarantee shipment by September 11, 2011. To mark the 9th anniversary of 9/11, we here at WeAreChange New Jersey held a discussion and movie screening event in Jersey City the night before both to honor the victims and to premiere new evidence for public consumption. Here is the collection of footage from the event on 9/10/10. The trailer for 'Hypothesis' a documentary short about Steven Jones and his 9/11 research. The film tells his story in his own words and reflects the explosive controversy that ensued which resulted in everything from threats, bribery, and academic suspension. What started as a mere hypothesis became so much more. For those of you who remember 'Between the Lines,' that movie became this one. I plan to submit it to film festivals so we'll see what happens. MOST DANGEROUS MAN IN AMERICA: Great place for leafleting, signs, etc. !